Pyramid Federal Credit Union | COPE Community Services, Inc. Pyramid Federal Credit Union | COPE Community Services, Inc.
On Friday, April 21, COPE was presented with a donation from Pyramid Federal Credit Union (PFCU), as part of their “Caring is in our Jeans!” initiative, which is a result of a revamped way to wear jeans on Fridays at PFCU. Staff donate $2 per week in order to wear jeans to work that Friday. The money that is raised to wear jeans is all collected and then donated back to local nonprofit organizations. PFCU’s Speedway location chose COPE to receive the first donation of the new initiative. Employees from this branch raised $318 with their jean donations and a cupcake sale. PFCU then matched what staff raised bringing the total donation to $636 for COPE. 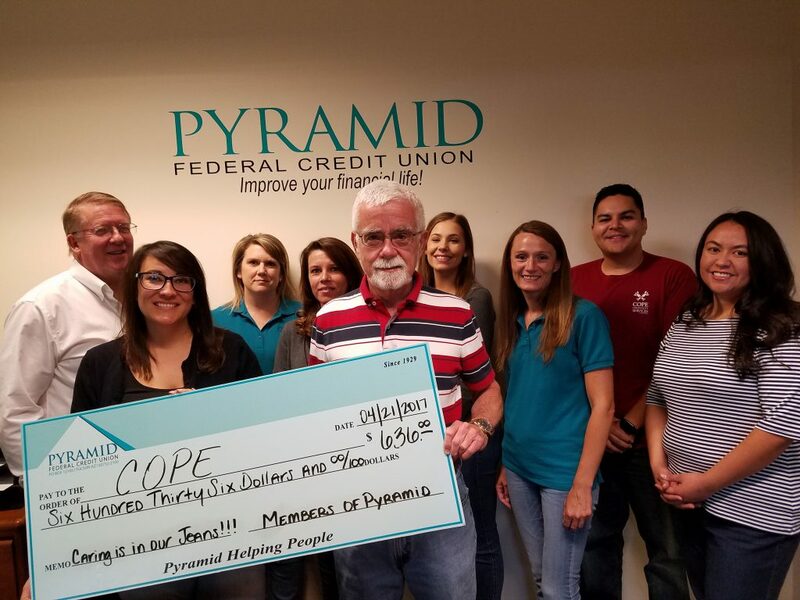 Thank you to PFCU and their great staff for giving back to the community and for selecting COPE as the first beneficiary of the “Caring is in our Jeans!” initiative.